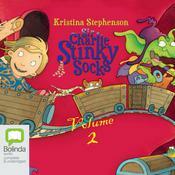 Sir Charlie Stinky Socks and his friends are back in these fast-paced adventures full of mystery and surprises! 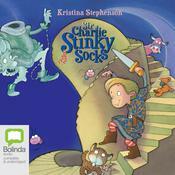 Sir Charlie Stinky Socks: The Pirate’s Curse: Once upon a time, a message in a bottle said someone needed help; help from a certain bold, brave knight! So, the brilliant Sir Charlie Stinky Socks, his cat Envelope and his good grey mare must find a ship so they can set sail and rescue the messenger. But, who needs their help, and what fearsome sea dangers and frightful pirates might they encounter on their voyage? 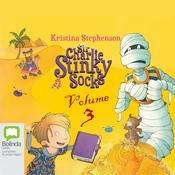 Sir Charlie Stinky Socks: The Mummy’s Gold: Sir Charlie Stinky Socks’ latest quest is to return a sack of stolen Egyptian gold back to its right owner, one Elfie Corrie. Sounds simple, but Sir Charlie’s adventures never are ... Join our hero and his faithful friends as their adventure leads them through the desert to a one-horse town and into a race against a not-too-friendly fellow. Sir Charlie Stinky Socks: The Dinosaur's Return: By the light of a silvery moon, Sir Charlie Stinky Socks and his faithful friends are heading for Thunder Mountain.